Tips and Tricks for Getting Up and Running with Your Wearable. If you’re reading this, I’m assuming you’ve purchased a smartwatch that’s compatible with your smartphone and are ready to get up and running with the wearable on your wrist. This article will walk you through some important first steps in customizing your watch and establishing an awesome arsenal of apps to make your life easier (and more fun). While Wear OS (formerly Android Wear), Apple Watch, Pebble and other platforms all have their own specific setup procedures, the following tips are meant for all users. Happy smartwatching! Bear with us while we cover the basics. After you take your shiny, new smartwatch out of its box, you may need to connect the device to its included charger so you start with a full battery. Assuming that’s taken care of, the next step will be to download the appropriate app to connect your smartwatch with your phone. For Wear OS users, this means grabbing the Wear OS app from the Google Play Store. Pebble users can download their app from the App Store or Google Play depending on which platform their smartphone uses. Apple Watch users, meanwhile, will find the Apple Watch app already on their phones once they’ve upgraded to iOS 8.2. If your smartwatch platform hasn’t been covered in this section, refer to the manual that came with your device for instructions—you should be able to find the necessary app in your app store easily. Once you have your smartwatch app installed, it’s time to connect the gadget to your phone via Bluetooth. Enable Bluetooth on your phone, and you should see your smartwatch pop up as an available device. Select it to connect, and you’re almost ready to go. A final housekeeping item before we get to the fun stuff: Take the time to make sure notifications are enabled on your watch. Basically, you want to ensure that messages and other incoming updates to your phone are delivered to your smartwatch. Hopefully, you’ve settled on a smartwatch that suits your style, be it the sporty Pebble or the Moto 360 with its round display. To add some more personality, you can download a new watch face. Pebble users can choose from a huge collection at the My Pebble Faces website, while Wear OS users can search on Google Play, where plenty of free and paid options are available. Similarly, the Apple Watch will support a variety of faces, from analog designs to faces that display the current weather in addition to the time. Keep in mind that most smartwatch manufacturers sell multiple strap options, so if you get bored of the default option, you can buy a band in steel, leather or a different color. Apart from text notifications and Google Now updates (for Wear OS users), apps will dominate your smartwatch experience. You’ll find that many of your favorite apps are already compatible with smartwatches; for instance, Twitter and Instagram will work on the Apple Watch, while IFTTT and iHeartRadio are compatible with Wear OS. Google Play has a dedicated Wear OS section, and the App Store will have an Apple Watch category when the gadget goes on sale April 24th. 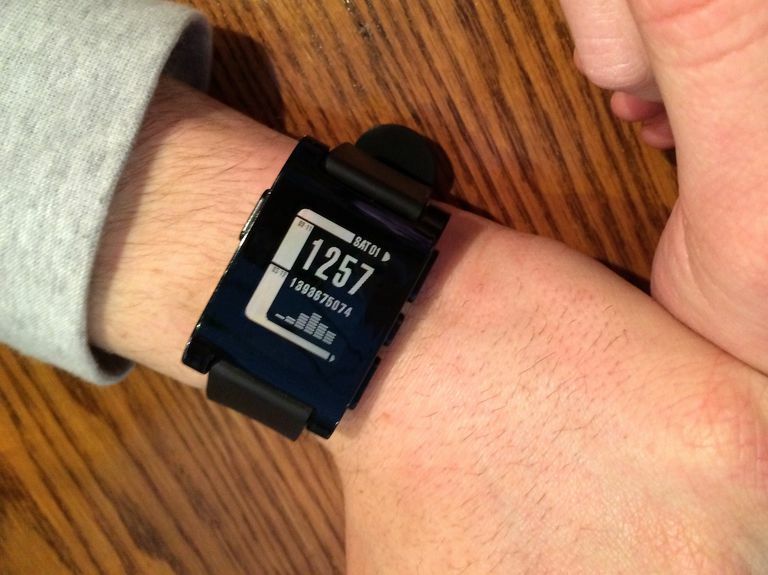 Pebble users will find compatible apps via the Pebble app on their phone. If you need a few ideas to start you off, consider downloading a fitness app to track your workouts, a weather app and a note-taking app like Evernote. Once you have some good downloads, you can specify which notifications you want to receive on your smartwatch. That’s when you’ll really get to enjoy the full benefit of having a mini-computer on your wrist!